Spain’s Costa Blanca is famous the world over for stunning scenery, clean beaches, friendly locals and plenty to do and see. A great holiday can be had here for almost any budget and any taste, so here are the 5 best places to stay, and why. 1. Benidorm. Party on dude! The sprawling and lively city of Benidorm is by far the areas top attraction, with the large majority of sun seekers arriving at El Altet Airport in Alicante heading straight for Benidorm for a week of fun and partying in the sun. Benidorm makes no shame of the fact that it is a hedonistic place where “Anything goes” (To a limit) and has remained popular with the British for decades. If you just cannot be without your home comforts whilst away on holiday then Benidorm is probably the destination for you, with loads of quality accommodation in Benidorm to choose from, and plenty of fellow countrymen to meet and share the experience! There are plenty of places to eat in Benidorm and it’s not just the stereotypical English fish n chips on offer because it is actually a very cosmopolitan place! The range of food available when dining out in Benidorm will surprise you; from traditional spanish fayre, to German food, Chinese, Indian, Latvian (! ), Irish, Dutch and a whole array of tasty cuisine from more or less any country that ever is! It’s not quite 24 hours a day partying though as the city is big enough to have quiet areas too, and is very suitable and safe for families. 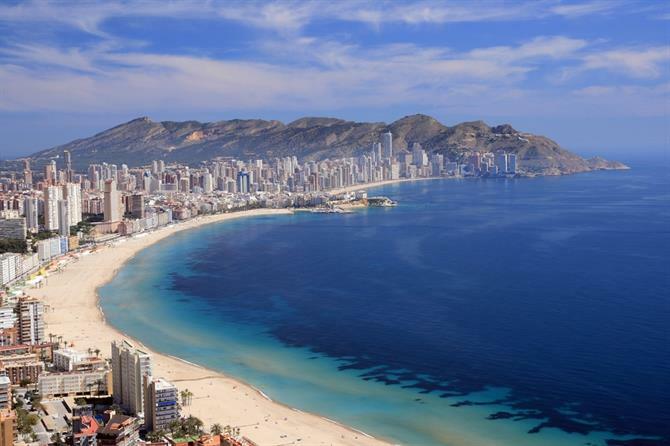 A more relaxing holiday stay can be had in the old town, or the Poniente beach end which is more “Spanish” and is quieter than Levante beach, however Benidorm is packed with things to do to suit all ages and all budgets so you will never be bored on holiday! Javea is a smaller town just up the coast a bit from Benidorm and is again a cosmopolitan town, attracting not just the British, but the French, Dutch, Norwegians and Germans too. It is noticeably more “Middle class” than it’s larger cousin, but still retains an air of fun in the sun for the discerning holiday maker. Javea is very different from Benidorm, more noticeably lacking the high rise hotels and apartment blocks, and enjoys an enviable climate for most of the year. The British presence here is conspicuous in such a small place and is reinforced with the many English cafes, bakeries, charity shops (!) and even a full size Iceland British supermarket selling more or less everything you could possibly need for a self-catering holiday in Javea. Javea has lovely golden sandy beaches, plenty of bars, restaurants and things to do and is somewhere for a relaxing holiday with all the home comforts that one could imagine, in fact they even have their own radio station in English (Bay Radio) which is worth listening to as anything that goes on, is advertised on the radio. 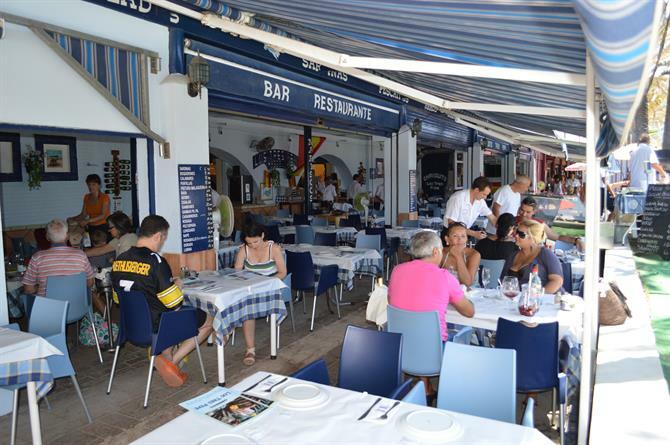 Popular with German families for many years now, but a viable alternative often overlooked by the British, Altea is a short distance along from Benidorm, but a world apart from it’s neighbour. It can be found just a short drive up the N332, or it is possible to take a tram from Benidorm to Altea too. Although sadly the town is bisected by the busy main road that runs through the centre, the harbour area is delightful and retains the look and feel of a traditional Spanish fishing village. There are various high quality apartments to rent in the area, and there is plenty to do and see in the town. The beaches are not so good as it’s larger neighbour but the seafront promenade is a lovely place to sit and enjoy a cool beer, watching the world go by, and giving you time and space to relax and enjoy your holiday on the Costa Blanca. Moving some distance further south, Santa Pola is nearer to Alicante airport and not far from the interesting city of Elche, which if you are renting a villa in Santa Pola, is only a short drive away, with a great array of shops, including the eponymous (but expensive!) department store of El Corte inglés, or the variety of other interesting and varied stores to be found in the “palm tree” city of Elche. Santa Pola’s main industries are tourism and fishing, and boat trips can be taken to the wonderful and enchanted island of Tabarca which is the smallest permanently inhabited islet in Spain. It is also a very important nature and marine reserve and dolphins can sometimes be spotted playing in the nearby waters. Not only that, the Island boasts a quaint but quiet fishing village, an ancient fort, a few very good seafood restaurants, a rocky beach with clear turquoise water, several coves and a scattering of secluded, tidal pools ideal for safe and private bathing. 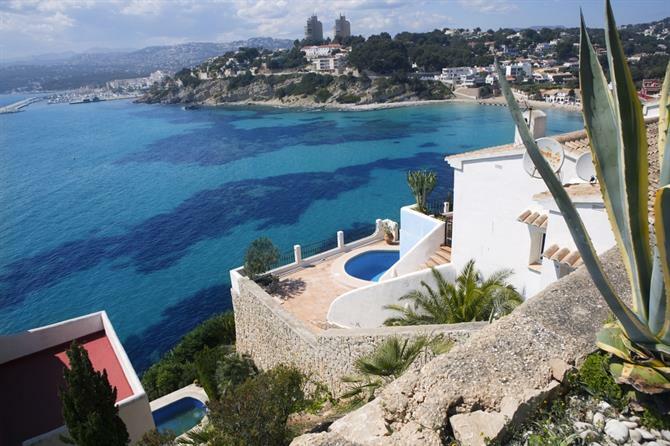 Moving back further north up the coast, the town of Moraira is a very upmarket tourist destination 80km north of Alicante and about an hour and 20 mins drive from the Airport. 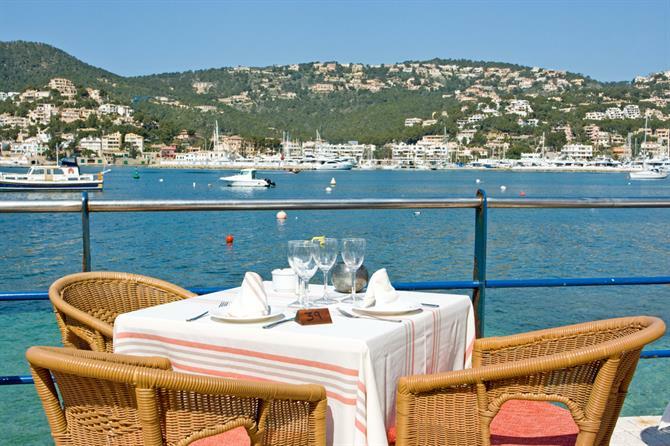 It offers a more relaxed pace of life for the many Europeans who choose to stay in Moraira each year. It is certainly somewhere that attracts the monied crowd and is home to many affluent expatriates from the colder climes of Europe, including British, French, Dutch and German. However that does not mean that only millionaires are welcome here, there is something for everyone, and just browsing through the accommodation available in Moraira will show there is something for most budgets although due to high demand, real bargains are few and far between. Although the town is another place where fishing is still evident today, it boasts another claim to fame as being an area of high quality grape production, notably the Moscatel grape variety, which is ideal for wine making. 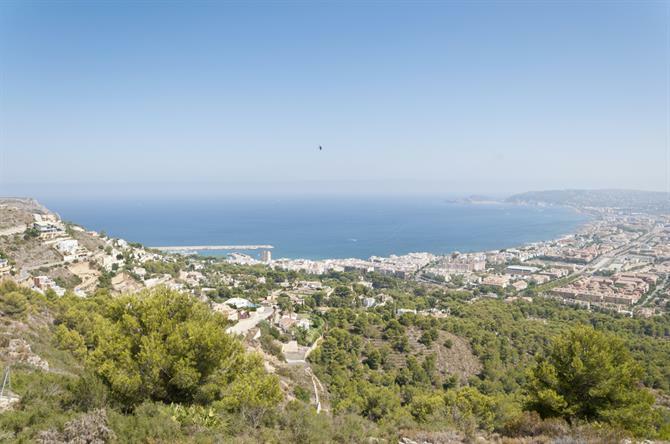 It is an area which, along with it’s outstanding natural beauty, is protected from development and high rise buildings and for a true Spanish holiday, the town has three sandy beaches which are very popular with families. There is also a glut of rocky coves and inlets which are frequented by snorkelers and scuba divers and basic courses, from approved and licensed diving school are available for the intrepid traveller. All in all, a visit to the Costa Blanca makes for an enjoyable and unforgettable holiday break for all the right reasons!